Uncle Mike always had a thing for loop around the boats. He did them for years on everything from the kneeboard and slalom ski to trick skis and the hydrofoil. 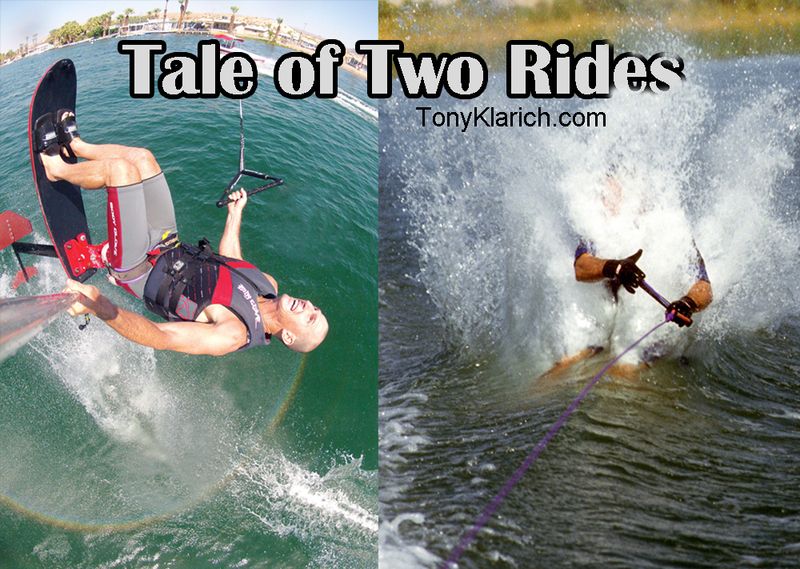 The loop around the boat became the standard way to turn around during Mike’s runs on the backwaters of Canyon Lake. He even spiced things up on his Air Chair when he added a wake back roll at the completion of his loop around. The only problem was that everyone in the boat had to duck to avoid decapitation when the rope came around, and it would catch on the corner of the windshield every time the boat turned under the rope. His ropes were wearing out after just a few weeks. Mike remedied this problem in late 1993 by building a pylon that was about nine inches higher than the normal one on tournament boats. The rope hooked on to the pylon about chest high, and nicely cleared the windshield during Mike’s incessant loop-arounds. His new pylon was a green light to take his around-the-boats to the next level, and I was subjected to driving Mike for the ”Barf-o-Rama.” The name was indicative of how you felt inside the boat while Mike was having fun doing loop after loop. The Barf-o-Rama was one loop around after another with just enough time to get the boat back up to speed and head into the next one. Mike’s record was 27 in a row. I’m glad Mike had fun, but it actually was nauseating to be in the boat. Mike’s trick did live up to its name with two people in the boat actually losing their lunch. Ron took Mike’s comment literally in the summer of 1994. He showed up a couple of days later with the first real extended pylon I had ever seen. 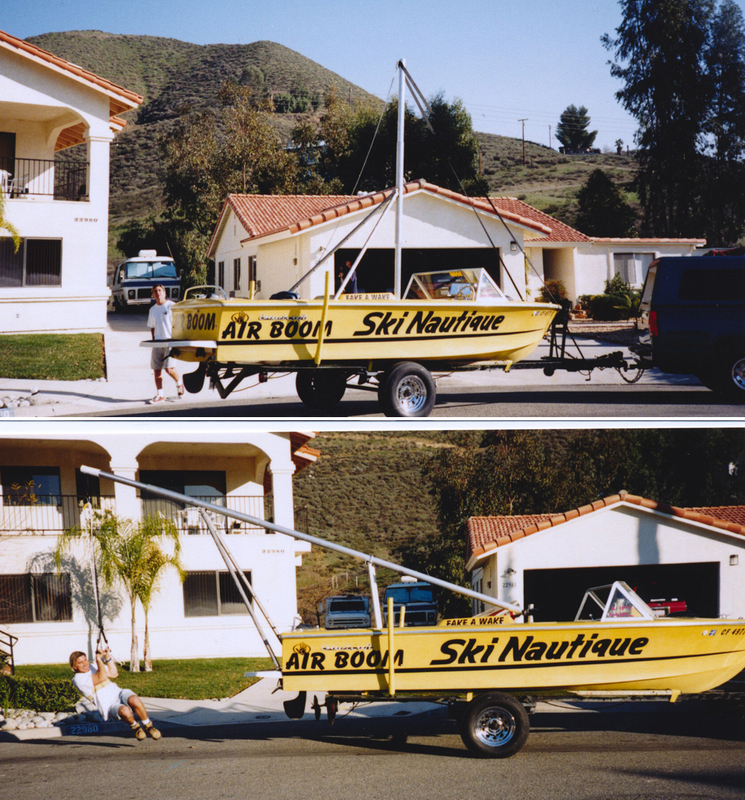 It was an eight foot tall monster pole with two support braces wedged into the rear corners of his MasterCraft. 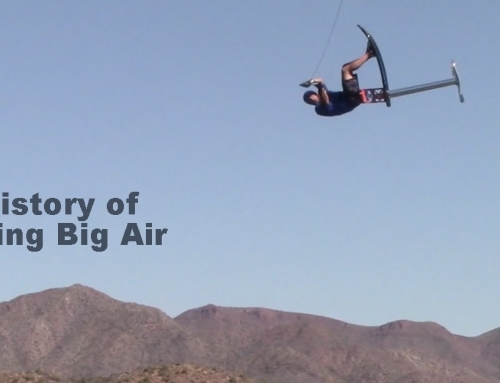 We excitedly tested it, and it was immediately obvious that we got more air than ever. The TV show “Burnt Toast” came out to Canyon Lake the following week to film our extreme skiing for a major cable network. The host Chris Harrison came to the lake and hung out with us all day (Harrison found later fame as the host of “The Bachelor.”) Canyon Lake always had wealth of ski talent and the video crew shot it all: barefooting, trick skiing, jumping, hot dogging, and most importantly for Mike, the Air Chair. Always a showman, Mike thought it was time to do a stunt he had been thinking about for quite some time: a flip over the five-foot wide dock on the Canyon Lake slalom course. Mike felt he now had an extra margin of “safety”, getting more air with Ron’s new extended pylon. The whole thing seemed crazy to me. The run up was short, and the landing was even shorter. But when Mike had his mind set on something, it was hard to change it. I was the best driver for the job, and in the end we pulled off an amazing stunt. 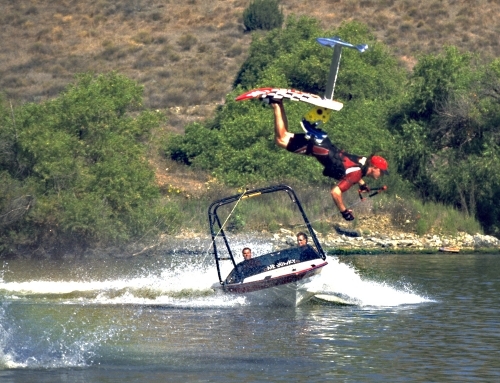 Ron did his thing on the wakeboard, and showed off his new extended pylon for the first time. Uncle Mike, Gary Harris, and I used Ron’s extended pylon for another first on the Air Chair. We took a three-man ride, and performed simultaneous flips on our foils. When the shoot was over, Mike hit the road again to promote Air Chair. As he traveled east, he shared news of Ron’s new extended pylon. One of Mike’s stops was Troy Navarro’s ski school in Texas. 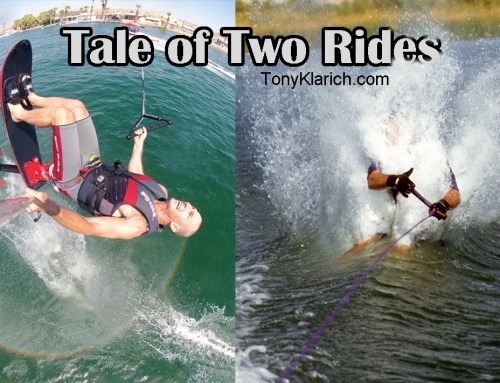 Troy was one of the pioneers in wakeboarding, and a top wakeboarder at the time. Anything to get more air behind the boat was a marketable concept to him. Troy probably passed the tall pylon idea on to Tony Finn who presented it to Tom Helwig at ECI, a manufacturer of barefoot booms. Tom conceptualized the new pylon as a variation of a barefoot boom, and that’s what led to the next innovation. Just like a barefoot boom, the Skylon used a cable to attach the end of extended pylon to the bow eye. Rear support braces were not needed, and the back of the boat was wide open. The Skylon was the first extended pylon widely available to the public, and it was an instant hit. Ron was mad that Tony Finn and Skylon had beaten him to the punch on his own invention, but Ron had delayed for months. 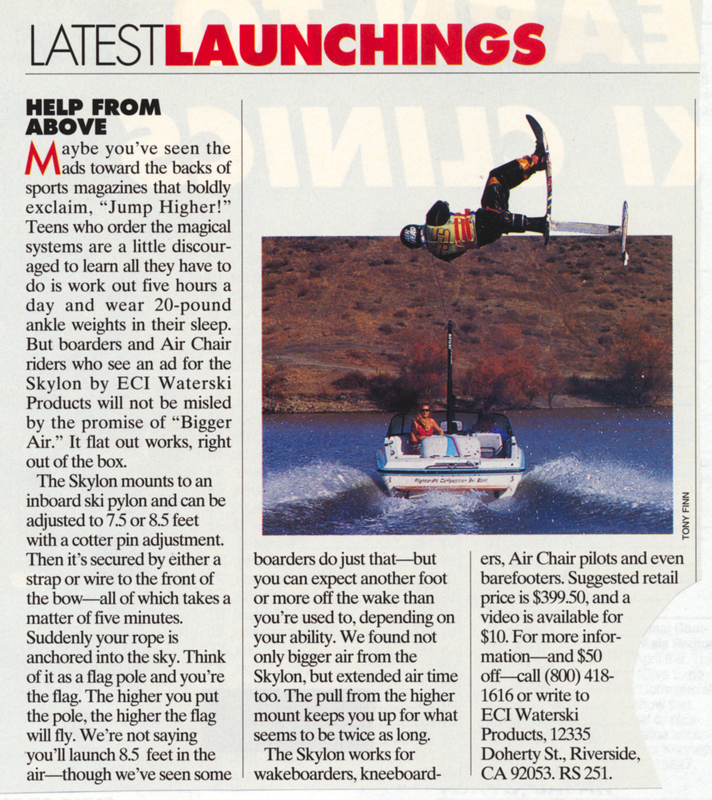 In the interim Tony Finn asked me to ride the Air Chair for Skylon’s boat show / dealer promo tape, and I agreed. I also appeared in a couple of their first print ads and press releases with Team Wake Tech wakeboarders Gator and Scott Byerly. 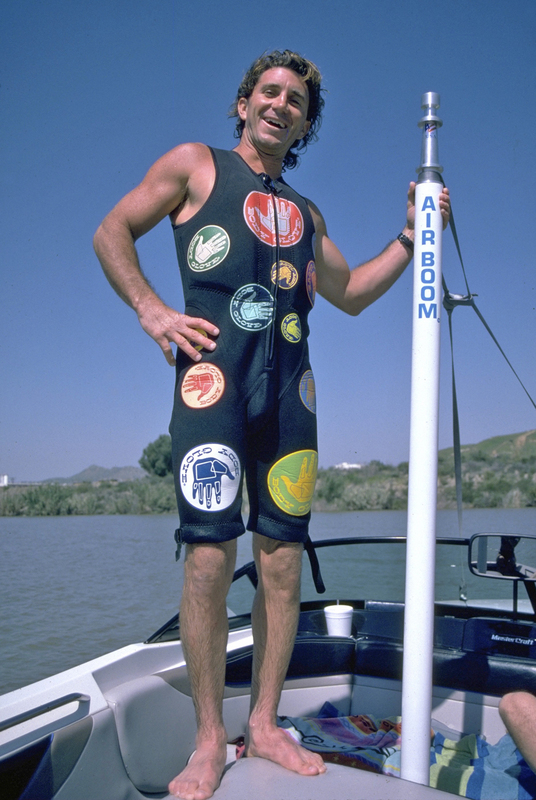 In 1995 Ron finally got up and going with his own company, Air Boom. [i] Since then he’s been a leader in innovative designs for towers, racks, and associated products. 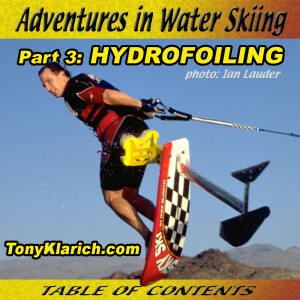 “Adventures in Water Skiing: Part 3, Hydrofoiling – Cover,” photo: Ian Lauder, 1999. “Ron Stack – Air Raley,” photo: Rick Doyle, 1993. 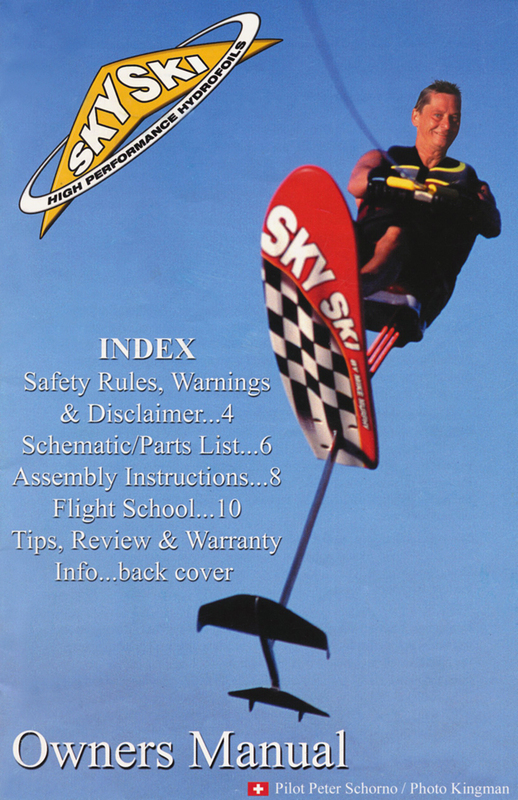 “Latest Launchings – Skylon,” photo: Tony Finn, WaterSki Magazine, June, 1995, 110. 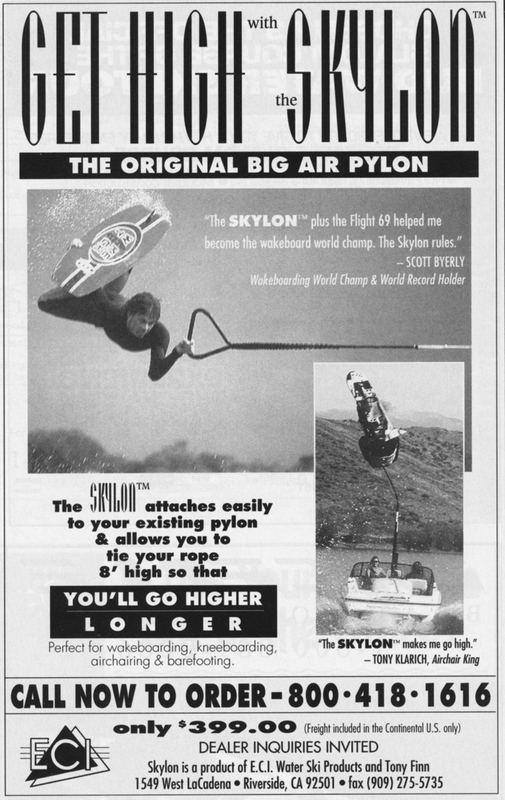 “First Skylon Ad,” photos: Tony Finn, WaterSki Magazine, June, 1995, 117. “Ron Stack & Air Boom,” photo: Kelly Kingman, 1996. “Ron Stack – Super tall Air Boom,” photo: Shonna Klarich, 1998. 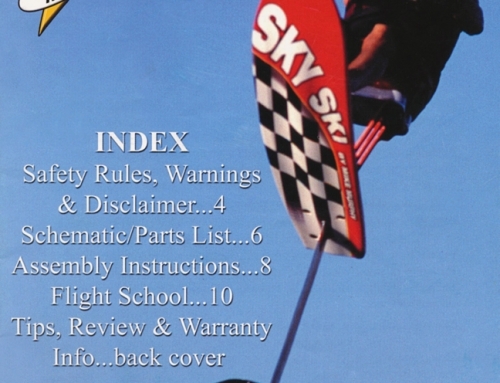 [i] “Big Air = Big Business,” Wakeboarding Magazine, Dec., 1995, 60.